Set default unit systems, serving sizes, and recipe file path in config.hs! Herm's is now on Stackage! At the moment, Herm's can only be compiled from source, but binaries are in the works! 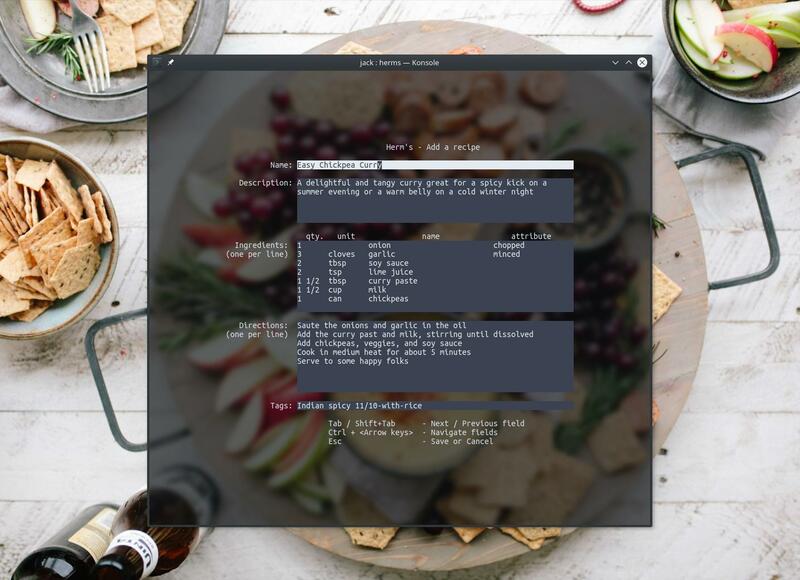 recipesFile : The recipes file and relative location. Make sure the file already exists by running touch FILENAME before running Herm's or it will throw a fit. This option currently supports relative location, as well; if your data directory is ~/herms/data, for example, and you want a recipe file in your home directoy called ~/GrandmasHugeCookbook.herms, set this option to "../../GrandmasHugeCookbook.herms".